Look At Free Music, Look How It Drives Web Traffic To You…. Free music equals serious web traffic, at least that’s what Coldplay have found with the free release of “Violet Hill” on their website April 29. 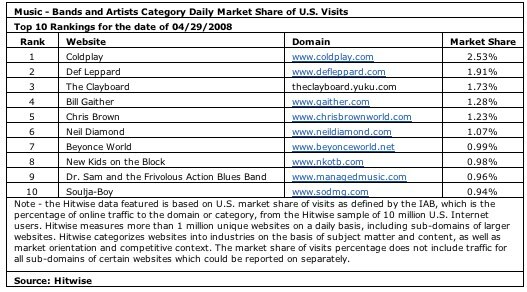 According to figures release by Hitwise, the Coldplay website shot to the top of the rankings in the Bands and Artists category, with 52% of visits to the site coming via an email sent to registered fans. Exclaim News reports the single was download 600,000 times in the first 24 hours. One song doesn’t make a revolution, and we’ve already seen experiments from other bands including Nine Inch Nails and Radiohead (the latter being a poorly executed publicity stunt). This sort of traffic does demonstrate some sort of tangible benefit for Coldplay, and therefore in favor of offering music for free. In Coldplay’s case they also insisted that those wanting the free single had to provide an email address, post/ zip code and country of origin; given just shy of 50% of those visiting the site for the free music weren’t registered fans, that’s around 300,000 new Coldplay fans now registered at the site (and still growing), 300,000 people Coldplay can now market albums, concerts and merchandise to. See some of Michael’s posts here and here on the death of the paid music industry.